We all have had the experience of looking at an empty (or disorganized) room and wondering, how do I pull this together, with more dread than awe. This question is debated at dinner tables with girlfriends, always while shopping, it’s tucked into comments on Instagram, texts from a friend, and even in emails. It is no doubt that designing the ideal sanctuary is no easy task, even for a blogger. Mike and I have partnered with BEHR Paint to create our dream master bedroom, and are coming up with a process that will make it easier for us and hopefully anyone looking for a practical guide to DIY a bedroom makeover. We currently are sleeping on a box spring, have the same bedding we have had for years, relying on temporary side lights, and have only a mirror and a lot of clothes to call “décor.” Yes, this means we lack side tables, dressers, or anything else you would think a respectable master bedroom would have in it. We have remained this minimal for many reasons. One of them being that nagging question above, how will it all come together? For us, our first step is to find inspiration. I will challenge you, as I do myself, to look for non-interior inspiration first. Look at landscapes, fashion shoots, and food. Though this may sound a little silly and indirect, I have found that by creating a palette inspired by nature and life, you will create something more you. The theory: if the elements work in nature, they will work together in a room. Too many times, I think we set our sights on the final look and call it inspiration though it helps us see the vision, it can make you feel disappointed instead of accomplished. The truth is, our room will never look like the one on Pinterest for many reasons, none of which has to do with skills. I promise you! It is amazing what a camera can do, believe me. 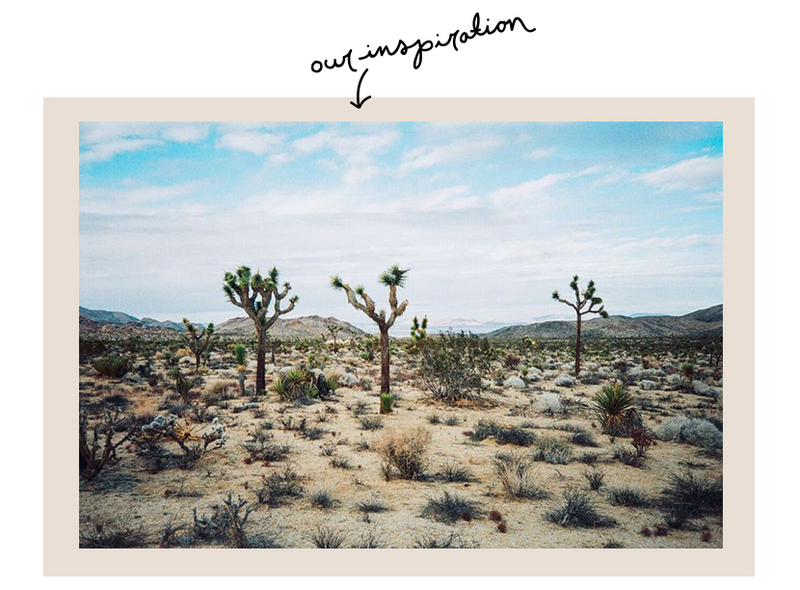 We chose to focus our inspiration on landscapes that we love and inspire us. We wanted to wake up in a room that felt like a morning on Lake Michigan. That soothing light so refreshing sight when you first open your eyes on a sunny morning. From there we searched the right image to be the focal point of our room. We chose a photo from Joshua Tree that our good friend, Michael Newsted took. It was the perfect image to hang above our bed in an oak frame that would continually remind us of one of our favorite places we have been, and of our friend. The image also acts as the perfect reference point for finding the right palette. Once we chose the print, we began to add other items to a pinboard that played into the color palette in the landscape image. 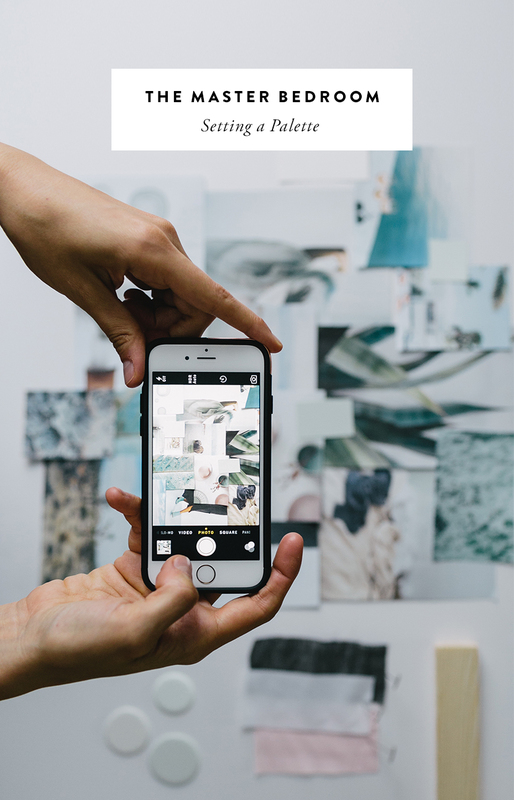 The beauty of using Pinterest in this way is seeing it all come together in one place, in a way that’s easily changed or updated. 4. MOOD BOARD – GO OLD SCHOOL! Since we felt the room had a strong visual direction, we felt it was time to create a physical mood board to bring our ideas to life. I gathered a few things to make this happen. 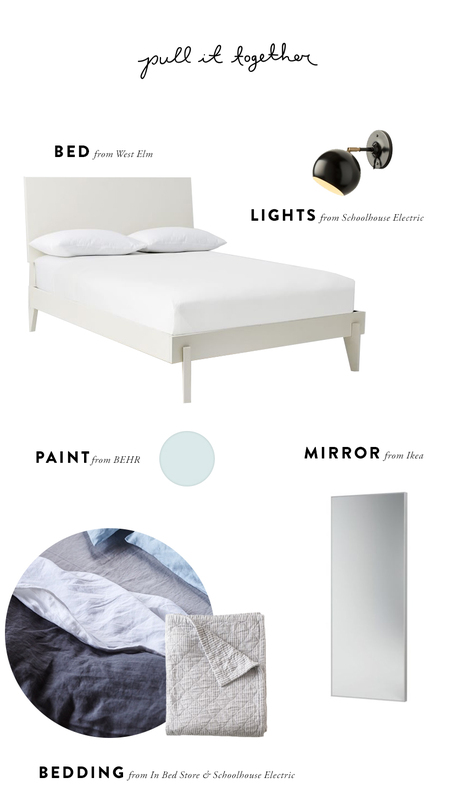 I had the pinboard on my phone while choosing linens and paints, which helped keep my vision together and top of mind when matching colors and textures. I highly suggest choosing three to five paint colors in various levels of chroma, blacks, and whites in the shade you are thinking. Yes, it is probably going to be about $20 – $30, but it helps you get a feel for the color in your space with your lighting. Sure enough, I thought I had chosen the color Snowbound from BEHR Paint and ended up falling in love with Breezeway. 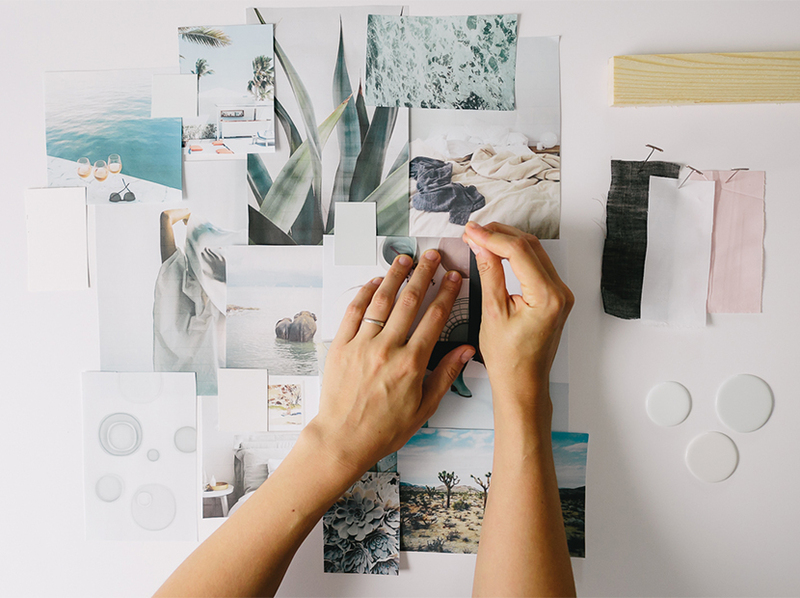 I really saw the difference in color when I poured them onto the mood board and let them dry. 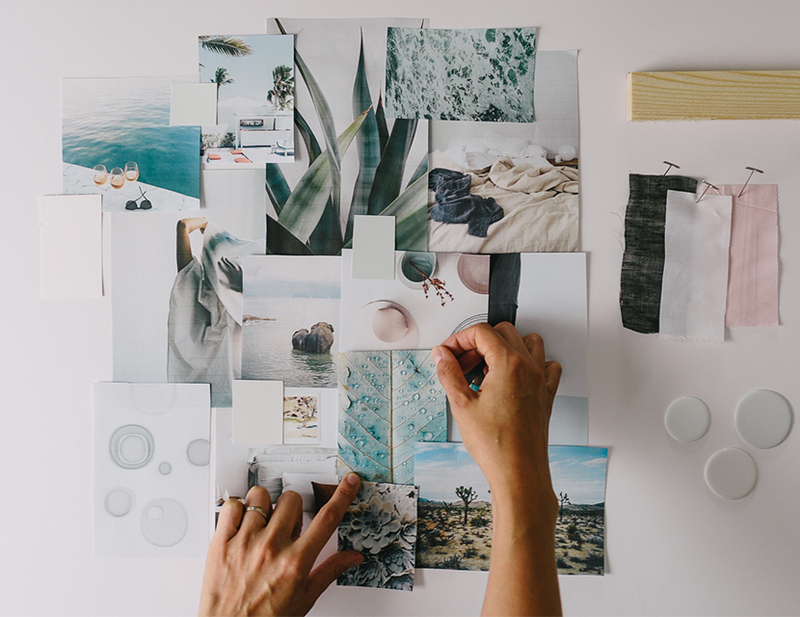 Once the mood board was together on our table, our whole vision came together. I saw that a charcoal duvet may be pretty, but the indigo color would be better. Once I had a cohesive vision, we were able to pull together the other pieces that would bring life to our space. – Bedding / We decided on an all white bed since the space is small. We also wanted to invest in bedding that would truly make our new wall color shine, and so we discovered the colors at the In Bed Store. – Mirror / We also decided to replace our old mirror for a new one that was slimmer, chicer, and could more easily hang on our wall. – Flora / These simple pieces and a few others along with a few plants should instantly make our bedroom be our dream space to wake up in every morning. Stay tuned to see what the room will look like when it’s painted, styled and complete.